Adore adore adore this simple spinach stroganoff sauce that’s cooked with some chicken all day in the slow cooker. It’s flavorful and super quick to get started in the morning! And for a ketogenic version of this meal, swap out the egg noodles for some sauteed cauliflower rice! To the slow cooker insert, add the chicken breasts, frozen chopped spinach, minced onion, garlic powder, chicken broth, paprika, cream of mushroom soup, salt and pepper. *Do not add the sour cream at the start of slow cooking. Set the slow cooker on low and cook for 8 hours. Just before serving, stir in 1 cup sour cream into the chicken mixture. Cook the egg noodles or other pasta, as directed. 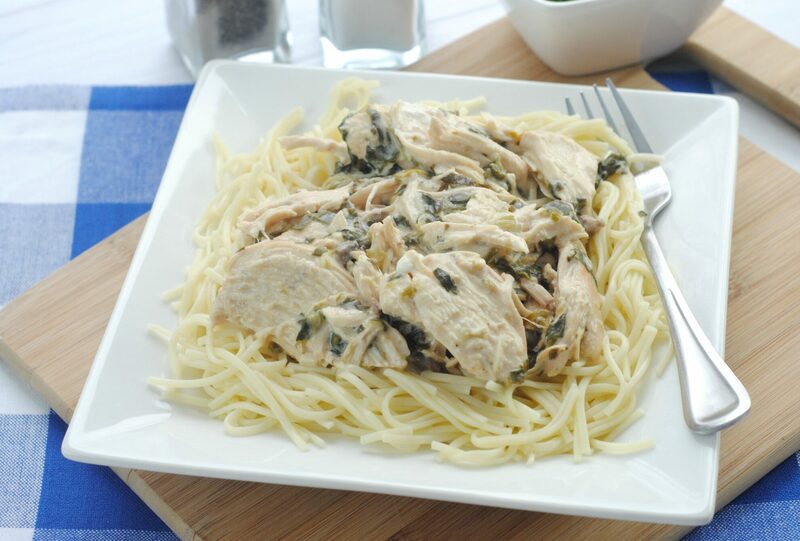 Serve Slow Cooker Chicken & Spinach Stroganoff over egg noodles with veggies. This recipe is featured on Julia’s Simply Southern Meal Plan Monday #118.